Vedic Art Courses are run on 2 level basis in Vedic Art . Vedic Art 1st Level (Foundation) Course opens you up to the 17 Vedic Principles and sends you onto your spiritual and creative journey. 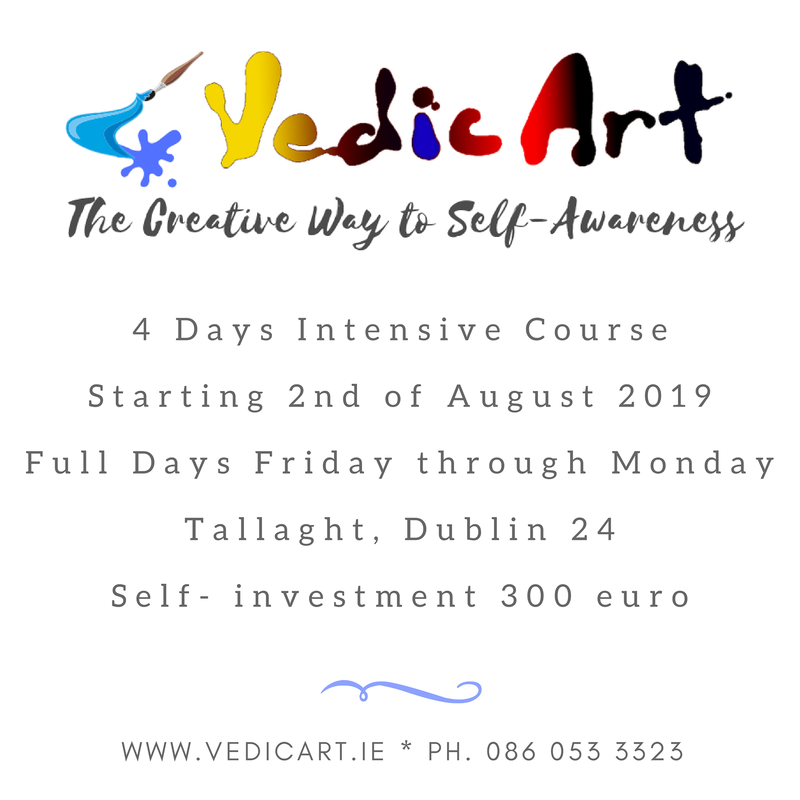 Vedic Art 2nd Level (Continuation) Course allows you to explore the Principles deeper and connect even more with your inner Creator. Both levels are taught in Ireland by Lorelai I. Dali in English and Polish language. It is possible to run the courses separately or sometimes both levels can meet during the same course. Vedic Art Teacher Courses are now offered in Ireland. There are two blocks of Teacher Course: TTC Level 1 that allows you to teach Foundation Level Courses and TTC Level 2 that allows you to teach Continuation Level Courses. Each block is taught over a full weekend. Teacher courses are theory based and don't include time for painting. Please be advised that you have to complete both levels of Vedic Art before continuing onto the teacher training. Vedangas Course is a weekend course that introduces you to six ancient qualities of Vedas that support Vedic Art principles. The official Coordinator of Vedic Art in Ireland is Lorelai I. Dali. If you are Vedic Art teacher who would like to run courses in Ireland or would like to become one, please contact Lorelai for details. During the course we paint accordingly to the 17th Principles of Vedic Art. Through the keys they present to us we can get in touch with our Higher Self and find the way back to our own heart, discover whom we are at our inner core: Divine Presence in us. The Principles are inter-connected, and they perfectly present the creative process not only in art but also in our lives. Future teachers can have theoretical information connected with practical approach by observing teaching for Foundation group in practice. New teachers can paint during lectures as well. MATERIALS: Painting materials not included in the price: canvas (8-12), acrylic paints (at least 6-8 tubes in different colours, 75ml or larger) and brushes. Other materials will be provided. NOTE: Please be mindful that number of places are limited and you are only guaranteed the place if you pay the deposit. ​Please read full Terms and Conditions. To book your place on any of the courses please contact us and pay deposit below. What date are you booking? Did you confirm your place? This evening you will be able to find out more about what Vedic Art courses are really about and try few practical exercises to get the feel of the method and how it can benefit you and your inner growth. To book your place for this class please contact us. Private course - either 1st or 2nd Level - takes place in private house in South Dublin. Course lasts 4 days ( 8 hours each day) and dates can be scheduled to suit your individual needs. Accommodation available upon request with additional cost. Skype course (for Foundation or Continuation level) can be scheduled in the time that suits your own personal needs. It consists of 15 classes (30 to 60 minutes each) and you complete painting exercises in your own time between classes. Please schedule 2-4 hours for each exercise between classes. 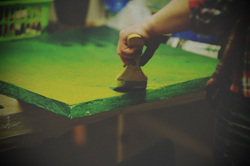 ​Please be advised that no painting materials will be provided for distant courses. ​"The Art of Letting Go"
Paint Pouring is a technique of allowing the painting to create itself. During the process we have little control over what happens on the canvas so it's a great opportunity to practice enjoying the process and letting go of the end result. Relinquishing need to control what happens with the painting helps us learn to let go of expectations in life as well. During this workshop you will learn basic paint pouring techniques, create 2 paintings that will be yours to take home and you will reflect on the process of letting go in art and in life. All materials will be provided. Mandala art has been used throughout the world for self-expression, spiritual transformation, and personal growth. Mandala is the ancient Sanskrit word for circle and is seen by Tibetans as a diagram of the cosmos. It is used by Native Americans in healing rituals and in Christian cathedrals the labyrinth is a mandalic pattern used as a tool for meditation. An archetypal symbol of wholeness, the mandala was used as a therapeutic art tool by psychologist Carl Jung, who believed creating mandalas helped patients to make the unconscious conscious. In creating a mandala we open ourselves to all the possibilities that exist inside and outside of us. Class is open to anyone, no previous experience or art skills are required. This is an intuitive painting workshop, and even if you haven't painted before, you can do it! All materials will be provided. 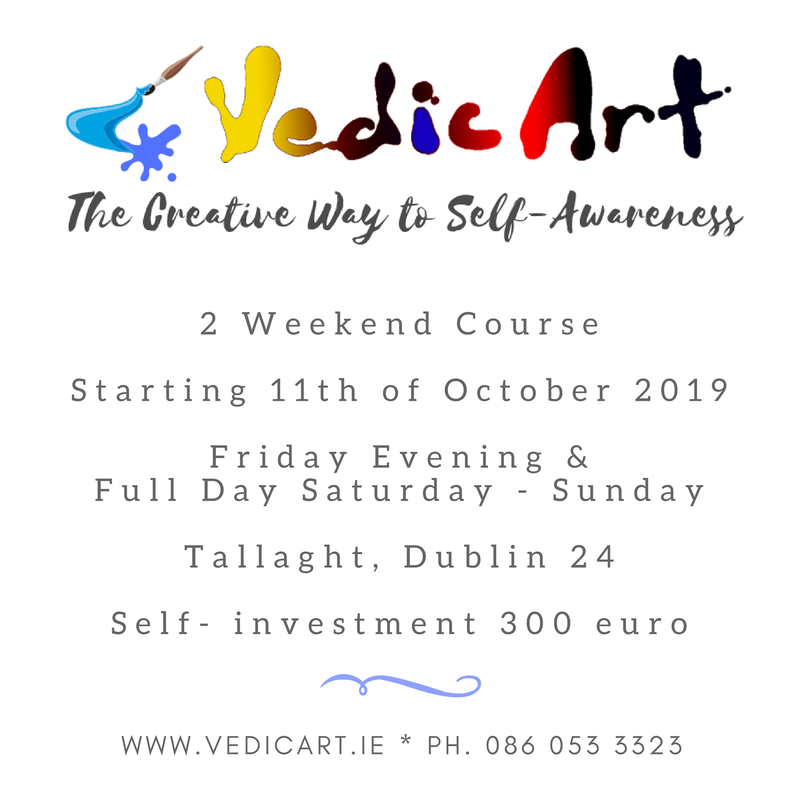 Details: This meeting is a chance for intuitive painters, who already attended Vedic Art Foundation or Continuation Courses (either with Vedic Art Ireland or anywhere else in the world) to be able to paint according to the 17 Vedic principles in a comfortable, studio setting. We would also like to invite other intuitive painters to join us in the studio, providing they are willing to respect the rules of openness, silence, respect and no judgement during the painting process. We all know how we attend different workshops and courses only to later not practice what we have learned. There are many reasons (which I call excuses...) - busy daily life, too many responsibilities, distractions at home (such as tv, internet or demanding family), lack of motivation to start, procrastination or - in case of painting - no appropriate space and materials to paint. That's why I set up these monthly 1/2 day meetings - to allow you to keep using the Vedic Principles to create, have fun and connect with your heart and the Cosmos. All that in peaceful, comfortable and open group setting. Tables, chairs and couple of easels will be provided but you're welcome to bring your own. This is not a teaching event but you would be able to inquire about Vedic Art method and courses. To book your place on any of the courses please contact us. You would love to attend the course but live too far from Dublin? Don't worry - we can come to you and teach the course wherever you are! Become a host for Vedic Art Course and attend the event for free plus make a commission! So get some friends together and see Affiliate Program for more details.